Thanks to modern food processing technology, building up a stock of survival rations is easier than it’s ever been. From cheap tinned goods to tasty dehydrated meals that let you eat well even when you’re living out of a rucksack, modern survival foods make prepping easy. Even your freezer is a powerful survival tool (as long as you can keep it working). What do you do if you can’t benefit from all these modern options, though? Maybe you’re pretty much self-sufficient in food, don’t want to buy what you can grow yourself, but can’t afford a full-scale food processing factory to turn out your own Mountain House meals? Or what if the crisis has already hit and you’re trying to build up a reserve to get you through the next winter? There are plenty of ways you could find yourself trying to put together a survival food reserve without the benefits of modern foods, but the good news is it’s easier than you might expect. After all, just a few generations ago our ancestors were building up food stores without most of the foods we rely on today. They weren’t doing it as a precaution against a possible crisis, either; it was a vital part of survival from one year to the next. If you lived on the old western frontier, or anywhere rural until the early 20th century, you better have a good supply of preserved food laid up by the time the first snow fell or your chances of making it through to spring weren’t that good. Considering that, it’s no surprise that previous generations had their own ways of putting up food that would last a long time. As recently as our grandparents’ generation most people knew how to preserve their own food. Those skills are just as useful for modern preppers as they were for our predecessors, so let’s look at some of the survival foods your grandmother would have made. Ham is one way to preserve pork; sausages are another. 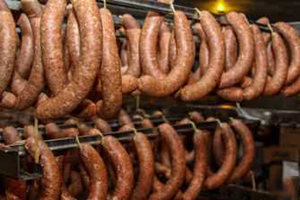 Many of our ancestors came to the USA from central and eastern Europe, where pork sausages are a major part of the diet. There were two reasons for that. One is that sausages could be made from scraps and poorer cuts of meat; the other is that, properly cured and air-dried, they can be stored for months in a cool, dark place. While the hams were soaking in brine, pounds of pork would be forced through my grandmother’s mincing machine, seasoned, then packed into sausage skins. Then the strings of sausages were smoked and hung up to cure. Once they were dry they would last through the winter and well into the next year; grilled, or cut up and cooked in stews or soups, they were a tasty and versatile source of storable protein. The truth is, our grandparents and great-grandparents grew up in a world where home refrigeration was a luxury. They needed food that could be stored for the long term, because crops and livestock were mostly available for processing on an annual basis. That meant pretty much anything they canned, cured or otherwise preserved was good for at least a year. So, if you have your grandmother’s old recipe books around the house, dig them out and take a look; there could be a lot of great survival food ideas in there. Don’t be misled by the name – this old delicacy isn’t a dairy product (although it does usually have bits of head in it). Originally from Europe, it was popular for generations in the USA, too. In fact it’s still popular in some areas, mostly in Cajun and Pennsylvania Dutch country. In the mid-20th century almost every rural family would lay up a stock of it after the slaughtering was done. One great thing about head cheese is it can be made from almost any animal; a calf or pig is the usual choice, but cows, sheep and deer work fine too. 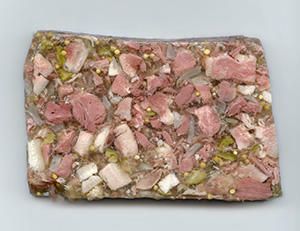 Head cheese is a great way of not only using up tricky cuts, but also of preserving meat for long-term storage. It’s made by taking the head of an animal, removing the brain, eyes and ears, then slowly simmering what’s left in a pan of seasoned water. This process doesn’t just cook the meat; it extracts natural gelatin from the head. After a few hours, depending on the size of the head, the meat is stripped off and chopped into small pieces. The gelatin-rich stock is simmered a bit more to reduce it, then the meat is put in a mold or jar and the stock is poured over it. When it’s cooled you’re left with a meat jelly that can be eaten cold. For long-term storage it was made in jars, then canned while the stock was still hot. That way it would last in the root cellar for months. Ham’s one of those things we pick up in the grocery store and the label says “Once opened use within 3 days”. Ham isn’t so delicate, though. In fact it originated as a way of storing meat through the winter – and sometimes well into the next year, until a new batch of hogs were ready for slaughter. When my grandparents butchered their hogs, that was the cue for ham curing to start. Some hams would be buried in salt then pressed to get the blood out, washed, and hung in the root cellar to dry. Others would be soaked in brine for a week or two, then hung up. The brined ones were ready to eat as soon as they’d dried; the others developed a richer flavor, but had to be left to cure for months. If there’s one thing this site seems to love as much as articles about surviving an EMP attack, it’s articles about lard. That makes perfect sense to me, because lard is a great survival food. It’s healthier than a lot of modern spreads, and even butter. It’s versatile, and can be used for frying, baking and general cooking, as well as an ingredient in some delicious baked goods. It can be used to preserve meat. It’s rich in calories and also has plenty of essential fatty acids and fat-soluble vitamins. Best of all, it’s easy to make and stores for a long time. My grandmother made her own lard every fall when the hogs were slaughtered. Butcher a well-fed hog and you’ll end up with plenty of fat. To the horror of today’s health-conscious foodies this wasn’t thrown away. It was cut into small cubes, put in a pan with a little water, then slowly rendered down over a low to medium heat. After a couple of hours she was left with a basket of delicious pork cracklins and pints of lard. 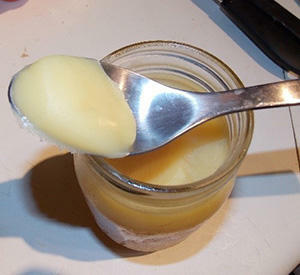 Poured into jars, pressure canned and stored in the root cellar, that lard would last a year or more. Nutritionists might hate sugar, but it’s a great survival food. Easy to digest, packed with calories and useful for preserving other foods, sugar is something we all stockpile. Our reserves won’t last forever, though, and what do we do once the last spoonful of sugar is gone? Not many of us want to go through the hassle of growing, then cutting, sugar cane and building a press to extract the juice. Luckily there’s an alternative sweetener that’s much easier to produce. 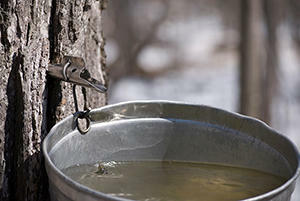 My grandfather used to tap a couple dozen maple trees for their sap every spring. Once he’d filled enough buckets with sap my grandma would slowly boil and skim it until it was reduced to a thick, sweet syrup. We ate that on pancakes, but it’s also a great all-round sweetener. Fermented cabbage isn’t to everyone’s taste, but if you can’t get your hands on fresh greens for a while you’ll be grateful for a source of essential vitamins. Sauerkraut was developed as a way of preserving cabbage for long-term storage, and it used to be a regular item in the fall canning season. If your food reserves are based around dry goods and canned meat, digging out your grandmother’s old sauerkraut recipe will let you add some much-appreciated vegetables to your diet.